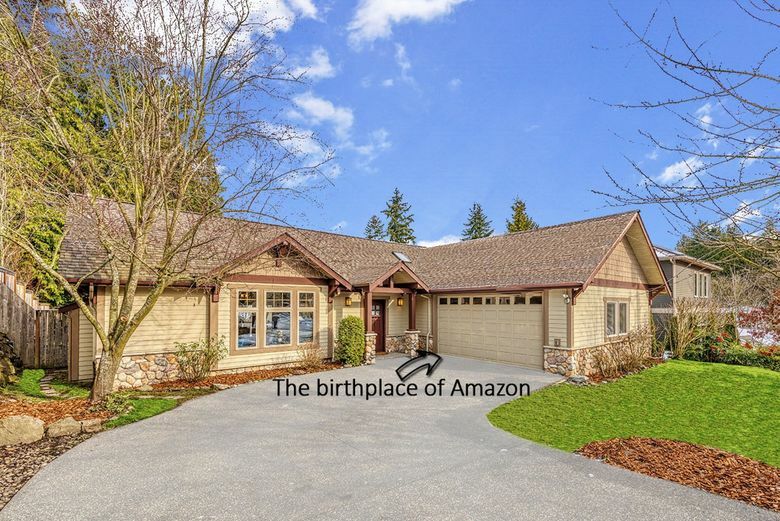 The garage attached to the three-bedroom, 1.75-bath craftsman on Northeast 28th Street was the original Amazon HQ. But “The Everything Store” book, which chronicles the company’s history, says in reality Amazon was based there “for only a few months.” When it started hiring more people, it moved to a small office in Sodo, and Jeff and (now soon-to-be former) wife MacKenzie moved from the house to a Belltown apartment. Inside the garage, “Bezos built the first two desks out of sixty dollar blond-wood doors from Home Depot, an endeavor that later carried almost biblical significance at Amazon, like Noah building the ark,” the book reads. Bezos never actually owned the house. He’s now the richest person on earth, with a net worth of $132 billion, but back when he started the company he was renting. Former homes of famous people don’t always get marketed as such — sometimes it’s not clear from the listing that it’s anything more than a regular old house. In fact, last time the West Bellevue house sold, in 2009, the buyer, a T-Mobile employee at the time, reportedly didn’t know of any Bezos connection until a reporter told him. Bezos now owns a waterfront Medina estate valued at $76 million, and The Wall Street Journal reported he also owns the $46 million property next door. He also has several other properties around the country, including in Washington, D.C., Beverly Hills and Texas. Amazon maintains its main nucleus of more than 40 buildings in Seattle but has somewhat gone back to its roots by expanding recently into Bellevue, albeit in shiny new office towers this time.